See how 360 Labs helped Ryder dazzle investors with a cutting-edge VR video facility tour experience. 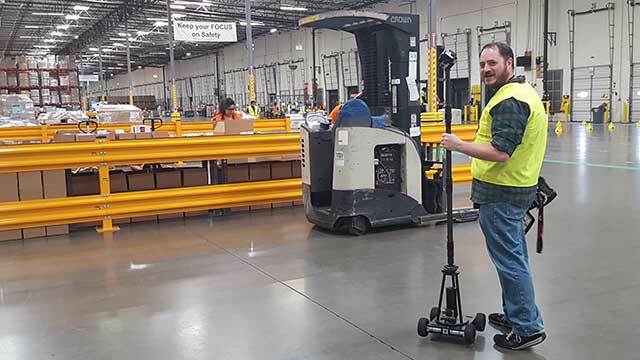 Ryder reached out to us to produce a 360 VR video solution to showcase their state-of-the-art warehouse capabilities. With an event planned for investors, they wanted something fun and exciting to show off their LEAN warehouse practices. Their ask of 360 Labs was to produce the content, provide a custom app solution for them to show it on both iOS and Android, and provide custom branded cardboard viewers to give away to attendees. We started by preparing a very detailed timeline, working with vendors on deadlines and schedules to make sure that delivery would happen before the event. We worked with our friends at Wemersive to have the applications designed and developed. They provided a great branded application for both Android and iOS that you can find in the app stores. The good folks over at Dodocase did an amazing job with a quick turnaround for a few hundred custom Google Cardboard viewers printed and shipped directly to Ryder. The 360 VR video production started with a script developed by Ryder’s copywriter, we provided direction and consulting on what kinds of shots and visuals would better suit the 360 environment. We worked closely with facility operations and the managers of each department to plan our shot list and schedule. 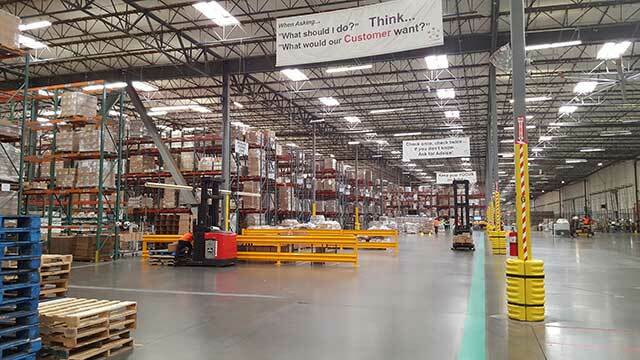 It was very important for them to be able to show the vast expanse of the warehouse itself and the efficiency of the work environment as a whole. Due to safety concerns, we definitely did not want to fly large drones and 360 camera equipment over workers. For this reason, we ran camera systems on secured cables over the assembly lines, using an electronic reel to advance the camera across a 200 foot work area. The end result is a seamingly "aerial" 360 shot that magically glides through the air. For motion on the ground we were already developing an in-house motorized dolly platform, and this project provided a great opportunity for it’s debut. ROVR, short for Remote Operated Virtual Reality, is a low and slow 4 wheeled platform for simple forward motion in 360 video. 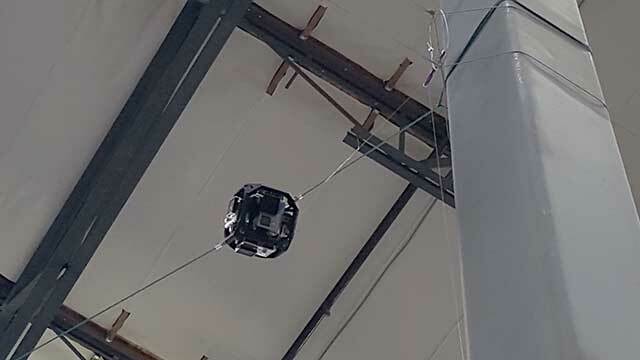 With an adjustable carbon fiber pole, it can be operated at human height and advance at walking speed, while the operator can hide outside of the 360 camera’s view. It was also important that we avoid causing any interruption to the 750,000 square foot warehouse which was operating business as usual. Soni Laing, Director of Brand Strategy and Advertising at Ryder, mentioned, “Site production was seamless. It was beneficial that it didn’t in any way hinder the operations of the warehouse. We captured a day in the life and for the most part, the team had no idea that a shoot was taking place.” However, we were stopped by a lot of folks who were admiring our gear and asking the usual questions about the cameras. Right away, we could tell that Ryder has a great company culture, everyone we talked to seemed excited about their job. After completing the 2 day production, Ryder asked us to arrange a professional voiceover session. We worked with a local sound studio partner in Portland, Tag Team Audio, who knocked out incredible quality recorded VO in record time. They also made recommendations and provided samples for talent as well, which helped us find a perfect match for Ryder’s voice. Beyond the production, we also provided consulting and support for demonstrating the content at the event. We purchased three Samsung Galaxy S6 mobile devices as well as three brand new Samsung Gear VR headsets. Each complete VR kit was pre-loaded with content and shipped before the event. The iOS and Android apps could then later be downloaded by attendees who received a custom branded Ryder Google Cardboard viewer. 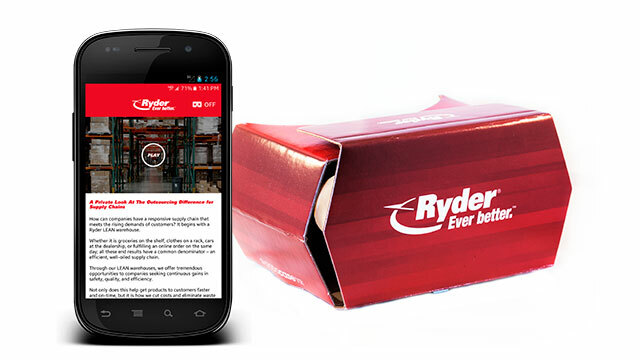 If you’d like to experience the Ryder LEAN warehouse in action yourself, download the publicly available 360 Video app for iOS or Android. You’ll be able to watch it hand-held on your mobile device or choose Google Cardboard mode to view in a headset. "We had great response to the video. The majority of people have no idea the enormity of a warehouse and all that goes into managing a space that large, in this case 750,000 square feet. This is an area of expertise for us so being able to showcase our capabilities with 'live' tour is impressive."